Is the stylish Linn Kiko network music system really worth £2,500? With bundles of impressively affordable wireless music streamers on the market – Sonos ZonePlayer S5, the Philips Fidelio AW9000, and the Denon Ceol etc – it's easy to forget about high end Hi-Fi brands like Linn. But with the Kiko, Linn has embraced the beautiful, practical and hi-tech without compromising on sound quality. The Linn Kiko is a stunning super compact all-in-one music streamer with active speakers and a choice of six colours. All you need is a computer, a long Ethernet cable and fat wallet. About as far from a high end audio 'rack' as you can get, the Kiko's elegantly curved aluminium chassis measures just 28cm wide, while the speakers stand 26cm tall. Available in white, black, dark blue, light blue, champagne and silver the emphasis here is on subtle, unobtrusive design. The speakers can be wall mounted and the main unit laid flat of perched on end, perfect for the bookshelf. There's no big touch screen either, just a simple – read: almost non-existent – blue LED display and power switch. The silver remote offers up the main options, but your computer or Smartphone/tablet will be doing the bulk of the work. The Kiko was created to play all your digital music with the minimum of fuss. It will play everything stored on your local network, tablet or phone, synch effortlessly with AirPlay and access internet radio and web services such as Spotify. Control comes predominantly via Linn's Kinsky software - allowing access to music stored on a computer or NAS drive or directly from your tablet or Smartphone (iOS and Android supported). But irritatingly it does all this while being wired to your router. Sorry folks, but for £2,500 you'll still need an Ethernet cable and a spare port on your router. Obviously this hard wired connection helps when handling high resolution audio – the Kiko plays audiophile approved codecs including FLAC and OGG up to 24-bit 192kHz – but it sure is inconvenient when it comes to finding a convenient home for it in the living room. More than just a music streamer, the Linn Kiko boasts 3.5mm line-in, a phono audio and optical and coaxial digital inputs and most significantly three HDMI ports and one HDMI out making it ideally suited to pimping your Blu-ray and TV audio. But for a wireless system there are plenty of cables. And they don't come much bigger than the cables connecting speakers to main body. Concealing the power supply to the active speakers they're far from discrete – not helped by the use of industrially inspired Neutrik Speakon plugs – but we love the overall effect. It screams quality. Manufacturers such as Linn usually recommend using a professional to install their systems – and this is still an option for the Kiko – but save your cash, setup is a dream. Download the Setup Wizard from the Linn website onto your computer and it takes you gently through the whole process – from connecting cables to hooking up to the network – with clear, idiot proof pictures and instructions. The Wizard will even play a track to check you've done it right. The Kinsky app allows control of the Linn Kiko from a computer, iPhone, iPad or Android device. It works well and is packed with advanced options to help manage your networked music and online content but does lack the beginner friendly usability of something like the Sonos. Not a disaster, just a case of the more you use it the easier it gets. One set-up with Kinsky – or the more basic Songcast - you can also stream via AirPlay in iTunes, nice and simply. For £2,500 you'd expect to be impressed, and the Linn Kiko's aluminium clad cabinets don't disappoint. They may be small, but the individually amplified drivers are a treat for the ears. The Kiko thrives at moderate volumes creating warm, room filling results with exceptional clarity. From the most compressed MP3 to high resolution recordings the sound is a triumph. At volume it doesn't disappoint either, just don't expect such small speakers to relish a boom bass heavy beat. With no shortage of interior friendly audio streamers available the Linn Kiko looks – at first glance – to be criminally overpriced. 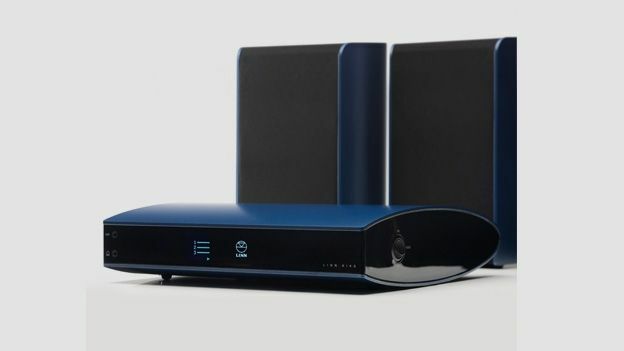 The need for Ethernet connection, while sonically justifiable is still annoying, but this is no ordinary all-in-one streaming speaker box; this is high class, high fidelity. If you're serious about sound quality and demand elegant design not black boxes and buttons it's a price worth paying.